Welcome to the Bunny Garden! and he makes sure the asparagus grows straight and tall. A white lattice fence surrounds the garden where carrots are abundant. 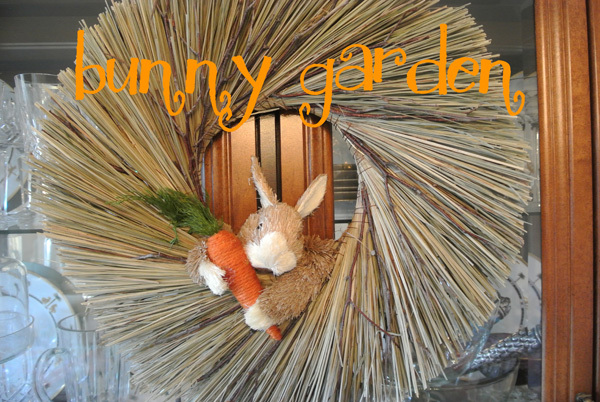 The fence helps to keep everything contained in this busy bunny garden…. bunnies can be quite messy you know! 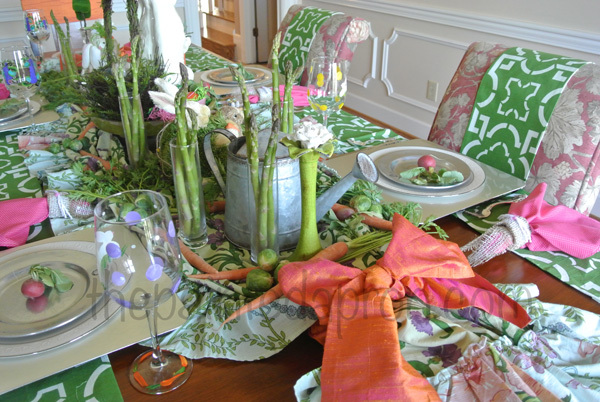 The garden itself is all dressed up for Easter with silk bows… the color of carrots of course! 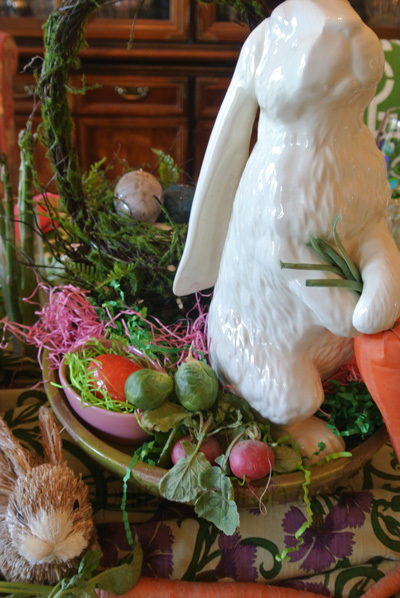 Carrots, radishes, Brussels sprouts and asparagus, make for a garden of very happy bunnies! that was going to need some adjusting! I gathered each end loosely and tied them with a silk sash. 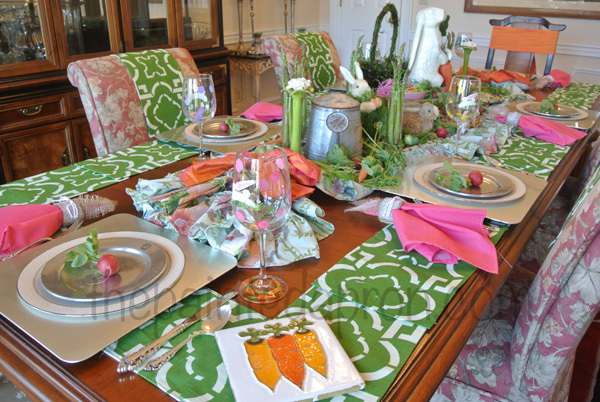 I put a stone green tier in the center for Benjamin and lined the edges of the table with narrow graphic print mats. 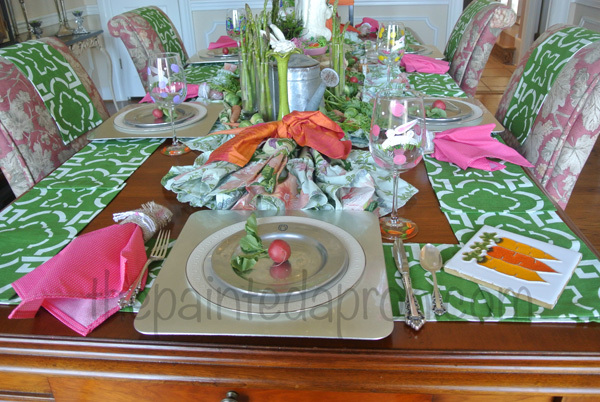 I tied the head chairs with silk sashes to match the table bows and covered the side chair backs with the same “lattice” mats. The sashes and mats are from another party I did several years ago and I have used them in a variety of ways…You never know when something is going to come in handy! 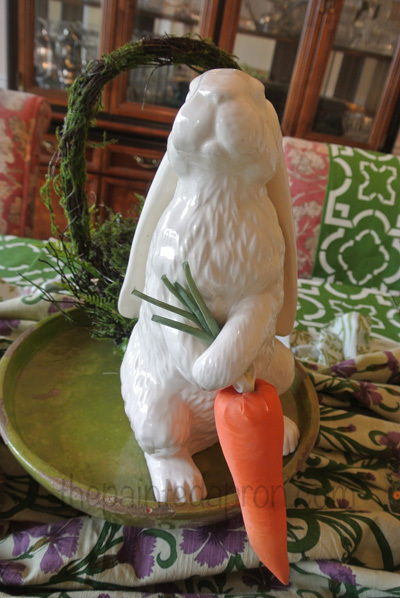 Benjamin hopped onto his pedestal and grabbed a big carrot. Isn’t he adorable? His bunny friends arrived and the garden was born! Stop by again soon when Benjamin shares his secret recipe for CARROT GARDEN DIP, it’s quite yummy! Too stinkin’ cute! Looking forward to the Garden Dip! Oh, my goodness!!!! I adore your bunny gardenscape! What fun! Happy Spring! Alycia, wow, thanks! Such praise from you is high praise indeed. 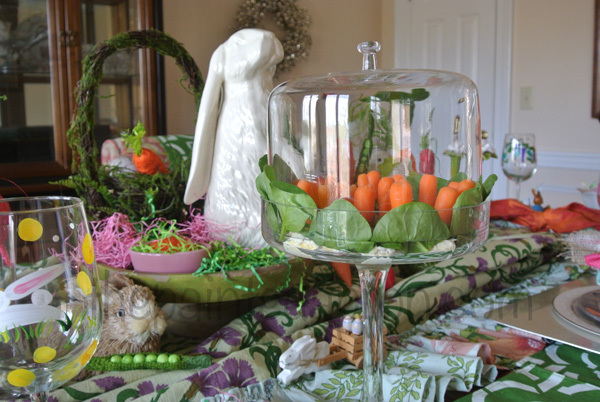 I did have lots of fun with this…we will be happily munching the veggies this week and will replenish the table for the big day. Thanks so much, have a great week! 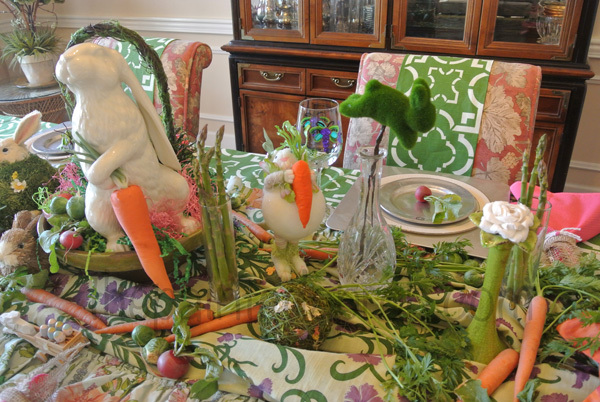 Well, on my way to tell you how cute the Leprechaun garden was, I got sidetracked by the bunny garden. Both are just adorable — you have quite a fantastic imagination and whimsical style! Thanks so much Carol, I heard there was a little shaking in the desert today! I have been watching the tennis at Indian Wells, wishing I was there…so glad it was a small quake! 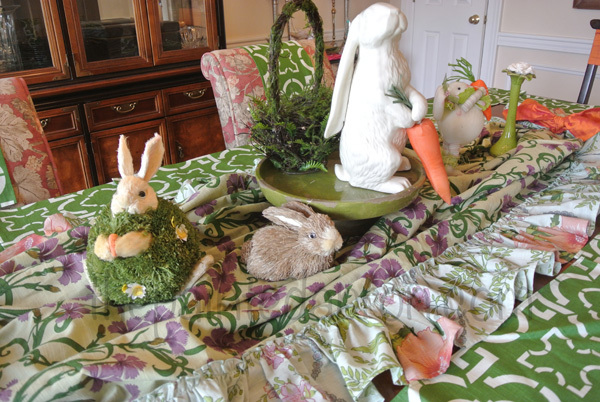 Thanks so much for sharing your super Easter tablescape! 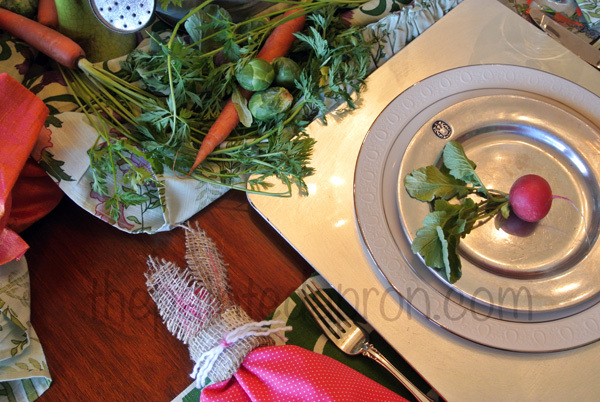 It is adorable and I loved seeing the photos you added of how the tablescape “came together”! 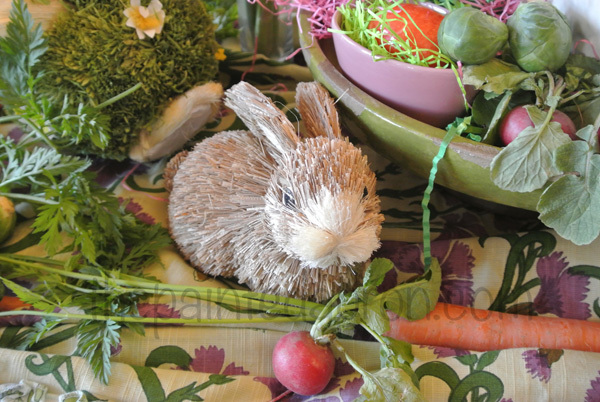 I am in charge of bringing dinner to our crochet group next week…I think I will include that really cute idea of the carrots. I saw your post over at “Savvy Southern Style” blog party. Wow Looks amazing and so fresh. I love the real carrots and all your clever touches. This is the cutest tablescape. 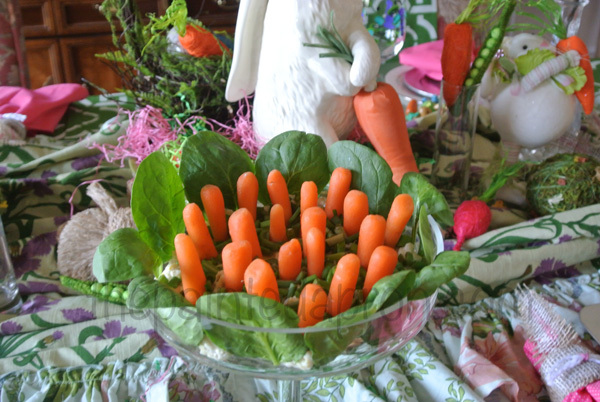 I LOVE your use of fresh veggies and the little bunnies hopping in the “garden”. I love the runner ides, thanks so much for sharing. 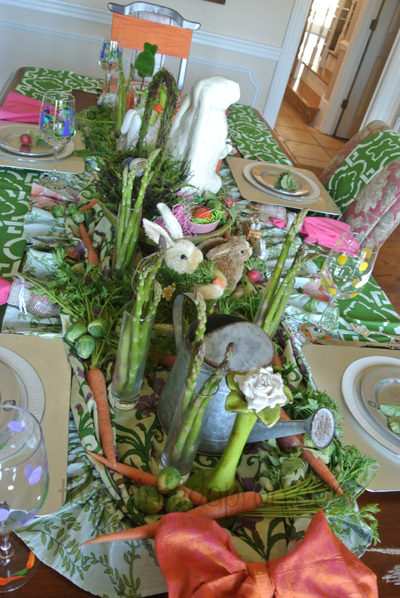 What a pretty table for Easter. Your garden scape is a darling idea. 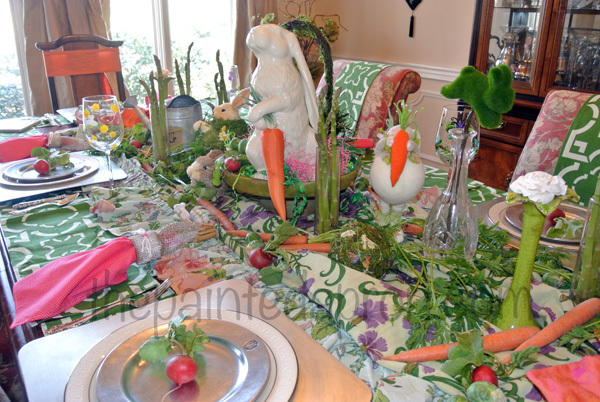 Your bunny table is so fun, creative, and absolutely darling! I loved reading the creative write-up. It’s so nice that Benjamin shares his table with so many other cute bunnies and all of the wonderful veggies in the garden. So cute! This is absolutely adorable! I love everything about this fun table. It’s impossible to look at this table and NOT smile! =D I love it! So creative! Thanks so much for sharing this on this week’s FESTIVE FRIDAY FIESTA Link Party! Have a great weekend!!! 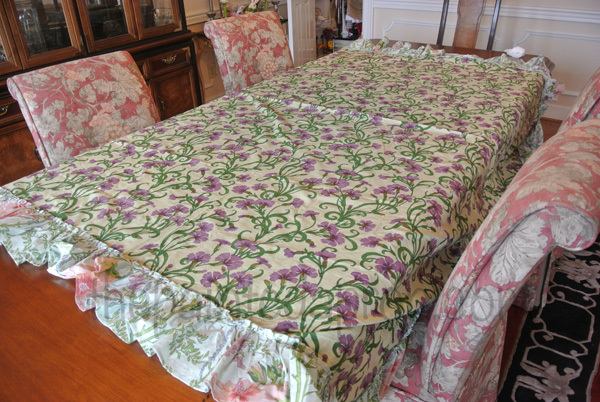 I love how you made the lattice mat’s go around the table…I have a square table and we use all 8 spots and it is hard to get place mats to not overlap. 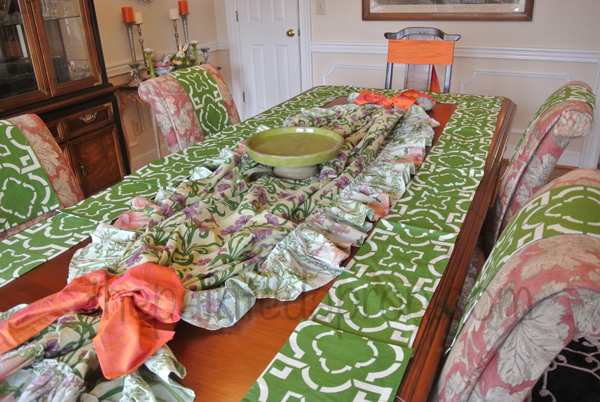 I love the idea of just making table runners go all the way around! 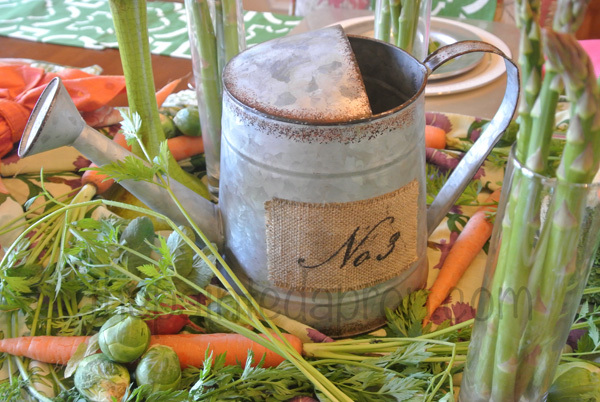 This table setting is just adorable! 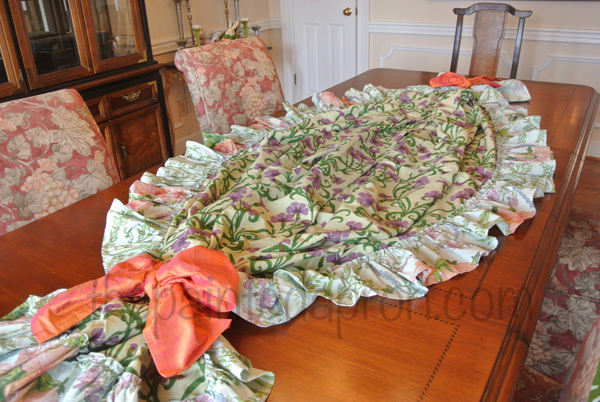 A new follower following from Savvy Southern Style! 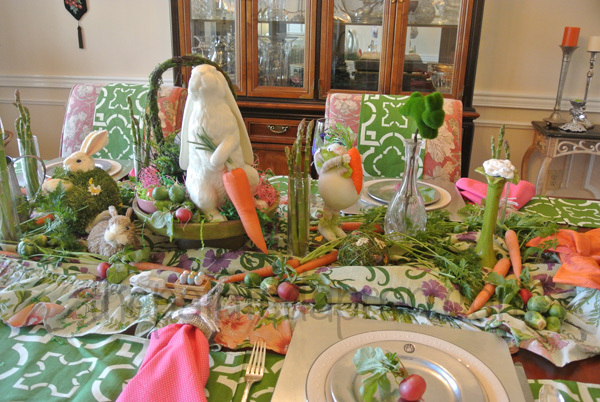 I rarely leave comments, but I MUST tell you how adorable your tablescape is!!! I love Seasonal decorating and this is right up my alley. Although I have done many tables also, I really enjoyed the clever use of your fabric and the display of your carrot dip was outstanding! 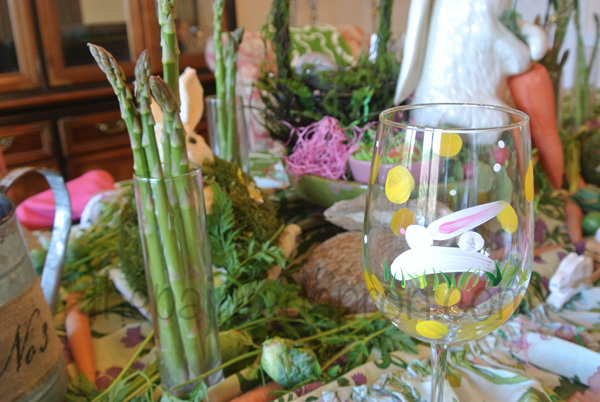 The hand-painted goblets were the finishing touch. Cudos to you!!! I enjoy your site. Thanks Regina, I am flattered by your comments and so appreciate you taking the time! Happy Easter to you also! This post is amazing, Jenna! So lovely and creative. Love the pictures of each step. I am so impressed with all the cute and clever details.